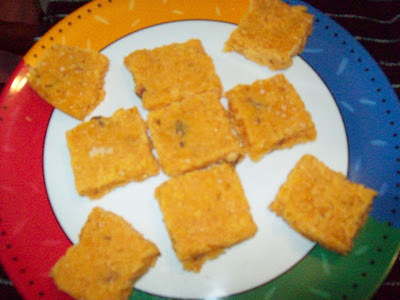 Mysore pak or Mysore paak must be one of the most popular sweets.coconut Mysore Pak is probably one of the easiest sweet which calls for minimal ingredients is made from coconut, chickpea flour, sugar and ghee. Take square plate and grease it evenly and keep aside. Bring to boil till sugar syrup is formed (one string consistency test). Add the Coconut and kesar colour keep stiring. 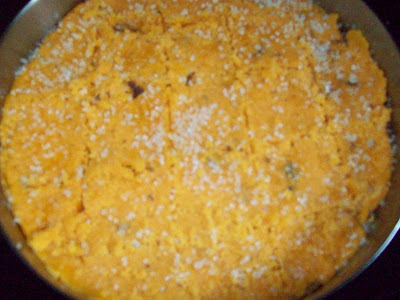 Stir continuously while adding besan to avoid forming any lumps. When it starts thickening Then add ghee little by little while stirring. add little ghee. and keep stirring. 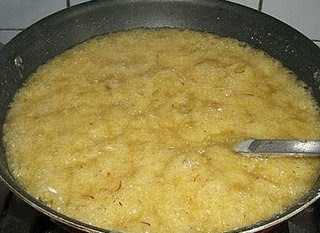 Stir and cook till the mixture stops sticking to sides of vessel and ghee starts coming out from the sides. When the mixture starts bubbling add cardamon and pour into the greased plate and shake the plate so that it spreads evenly. Leave 10 minutes and cut with sharp knife vertically and horizontally to make equal size square pieces. 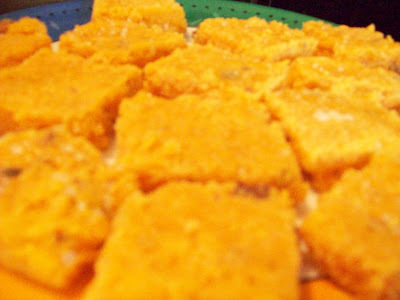 Coconut Mysore pak is ready. Enjoy the yummy melt-in-the-mouth sweets.. These can be stored for 3-4 days. Seriously! I have never heard of coconut mysore pak. Looks and sounds yum. Happy Diwali to u and ur family!! Coconut mysorepak is new to me. Looks delicious. Thank you friends for sweet comments.